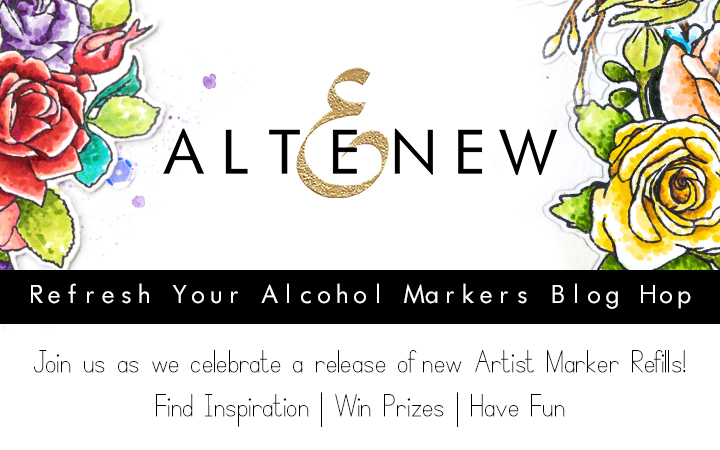 Welcome to the Refresh Your Altenew Alcohol Markers blog hop and giveaway. 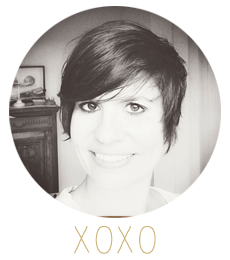 If you have come from Erica A-B's blog you are right on track. I was so excited to get my marker refills as some of them were really drying up. It is so easy to do as well. I created a mini book cover by combing the Pattern Play Diamond set. First I stamped the image with permanent black ink. Then I used a dot technique with my markers to add colour. This was such a fun process. Really relaxing and I didn't have to be overly concentrated on blending or getting the colouring right. You can see how I created the cover in the video below or watch it in HD on YouTube. I will draw a winner to receive a $20 gift certificate for the Altenew Store. Just leave a comment in the comment section. The winner will be announced on the 26th. Wow, such an interesting approach. The result is stunning, beautiful work. Oh my gosh, what a darling card! I love the background combined with that sweet bicycle. Outstanding! I want to try the dot technique now too!! Thank you for sharing! This is so creative with the dots and diamonds!!! The gold just makes the colors burst out so much more too!! Gorgeous! What a fun technique they way you colored the BG with dots. Brilliant technique. The dotted triangles are the best. Beautiful technique. The cards are great. Interesting technique and effect that it gives, Lilith!! I love your mini book cover! What a different way to fill in those diamonds! Thanks for the inspiration! A bright and cherry book cover! I love the bike with flowers! 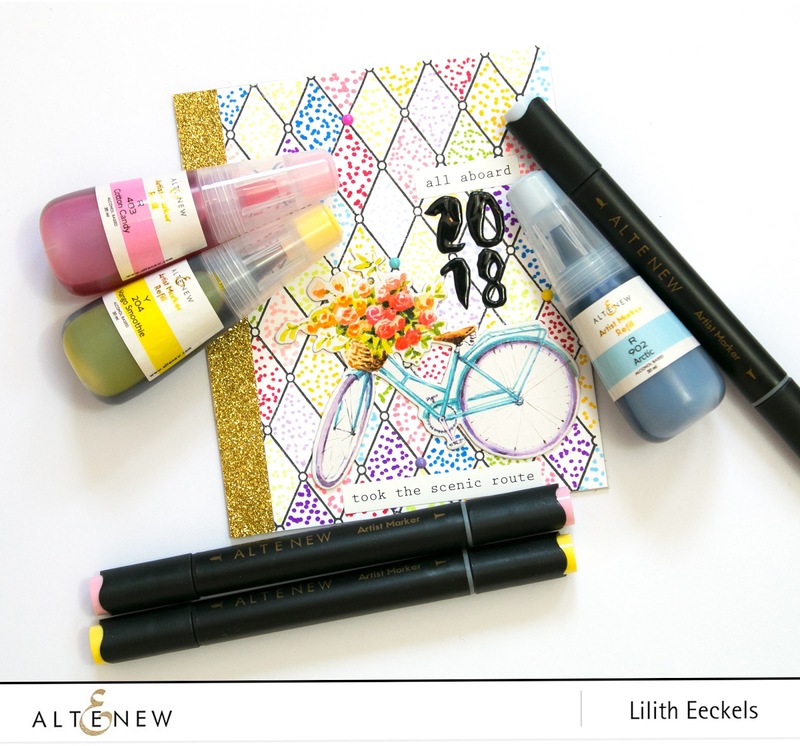 I love Altenew’s vibrant ink colors! Fabulous card, Lilith - thank you for sharing your talent with us. I love these colors and your beautiful work! Such a fun technique! I love all the colors you used! Wow what a pretty little book. I bet the pages inside are as pretty as the cover page!! Great concept - very creative. Beautiful coloring on the bicycle and flowers/basket and that background is super cool, I love it! Thanks for the inspiration. Another great technique! 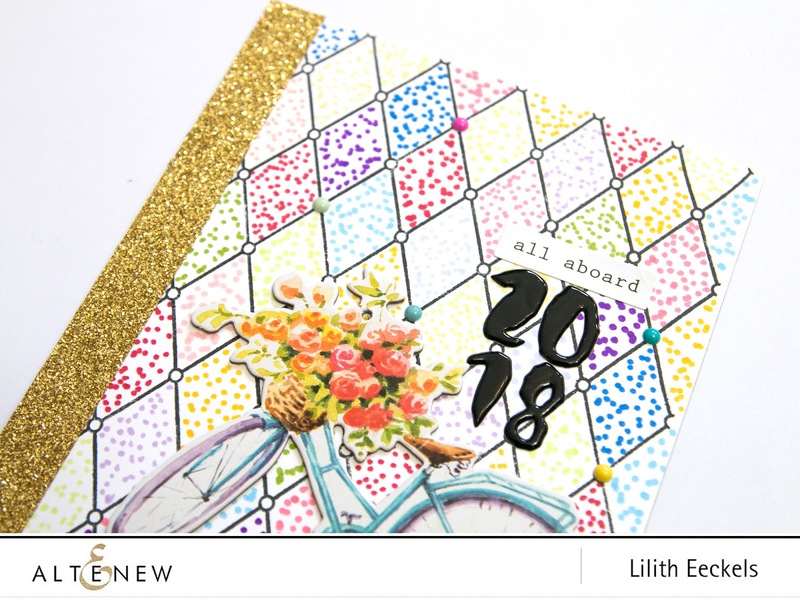 Love that you chose pointillism to add the bit of color preserving some of the white space to give an “airy’ feel to your design. Thanks for the inspiration Lilith! This is going to be a great little book. Hope to see more pages as you do them. How interesting, I want to try that!! It came out so pretty!! Thanks for teaching us a new technique!! This interesting technique makes a cute card. what a fun card, Lilith - and so pretty too! love that Altenew has these new refills as i am badly in need of them! Fun technique and wonderful results! Love this gorgeous book cover, Lilith! So nice to have refills for the markers now. Such a sweet card! The dots are so fun and whimsical. Beautiful bicycle sticker. I'm glad you were able to juice up your markers with the refills. What a wonderful card! Very nice. Oh , no I love these dotty background . The card is lovely. Thanks for sharing. I never would have thought to use these in this way. It turned out so cute. Thanks for the inspiration. I am on a Bike kick, just started riding again. I adore your card. Cute dot technique. What a beautiful and creative card. I love it! This is such a great idea! It seems a great way to use the markers too, by just drawing dots or stripes or something with them! It looks so easy and really adorable! Thanks for the inspiration! It's so colorful and fun. Beautiful book cover,i loved the way you used altenew markers,brilliant!! Wicked colourful cover. Really pretty to use the dots inside the diamond pattern & even nicer knowing you have lots of ink at your disposal to do it. Very inspiring to look for patterns inside patterns, thanks. Such a creative design! I love it. Love the rainbow effect and the little dots in all the diamonds. Cute bicycle with the flowers in the basket. Love the dots! They look fantastic! Thanks for sharing! Your dot technique is wonderful!! Textured detail that adds so much! 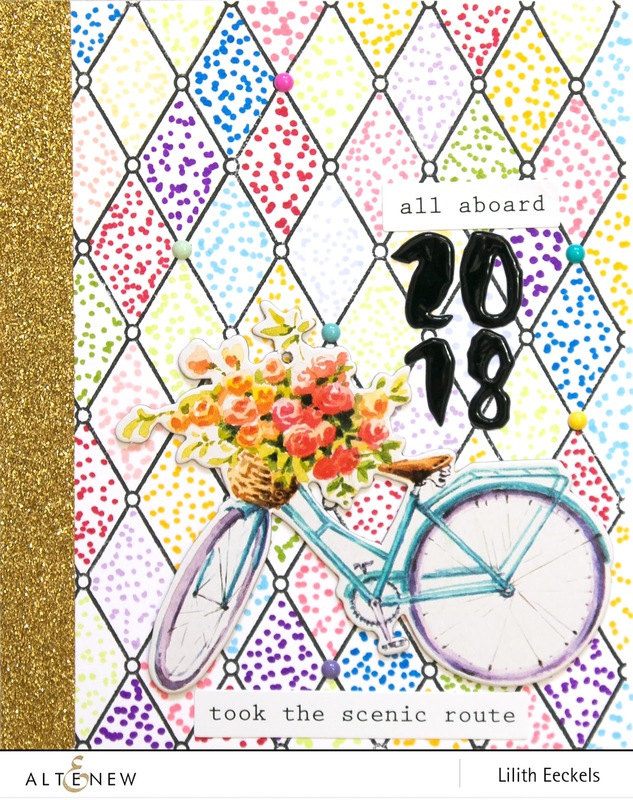 This is such a fun way to color; I should try this confetti/pointillism sometime. Thanks for sharing! So cool! Love the beautiful background. Never thought to do this with my markers! I can see how it would be relaxing. no pressure!